Manchester's Shoot the Moon and MediaCom Leeds have worked with Hitachi Personal Finance on a new £850,000 campaign, its biggest to date. The nine-week #DreamBig campaign is looking to raise awareness of the brand and its personal finance offering within the UK market. Included in the activity is a takeover of nearly all of the advertising sites throughout Liverpool Street Station and Glasgow Central Buchanan Street, key commuter hubs in London and Glasgow. These locations were selected by MediaCom, Hitachi Capital’s media partner, after analysis showed that these areas were most receptive to Hitachi Personal Finance’s proposition. The #DreamBig campaign will also involve social media, paid search, email marketing, PR and behaviourial advertising. The proposition is designed to encourage consumers to make the most of Hitachi Personal Finance’s lowest ever loan rates and turn their "plans into reality". Oliver Zebedee-Howard, creative director at Manchester's Shoot the Moon, the agency behind the campaign, said: "At the core of this innovative, fully-integrated campaign is an aspirational take on modern finance which offers huge scope to reach a relevant, core audience. 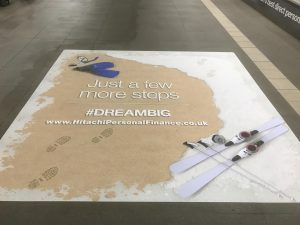 “Shoot The Moon has delivered a creative and strategic vision for the #DreamBig campaign to drive awareness and reap significant results for Hitachi’s Personal Finance service, and we look forward to seeing this vision come to life." Theresa Lindsay, head of marketing at Hitachi Capital Consumer Finance, added: "The #DreamBig campaign will deliver over 71 million opportunities to see our brand and generate a significant volume of business over and above our normal activity, making this the biggest campaign of its kind for Hitachi Capital in the UK."